I consent to PCCS Books sending me newsletters and occasional emails with new publication and events information. Pete Sanders - 2019 Mary Kilborn Lecture - Person-Centred Therapy: Fit for the future? The industrialisation of therapy: What is the impact of IAPT on counselling and psychotherapy? 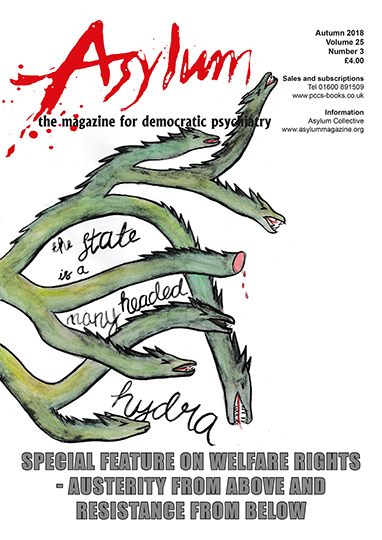 Asylum Magazine is published 4 times a year and is a forum for free and open debate about controversial issues in mental health and psychiatry. It is a place for the discussion of experience and ideas, and for campaigning for humane and democratic alternatives to traditional psychiatry. As a not-for-profit publication which is independent of powerful lobby groups such as mental health organisations and drug companies, it is a place where mental health service-users, frontline workers, adademics and allies can express their views. Asylum is produced by Asylum Associates and the Asylum Collective. © Asylum Collective and Asylum Associates on behalf of authors. Asylum Associates is a not-for-profit workers’ cooperative. The Asylum Collective is open to anyone who wants to help produce and develop the magazine, working in a spirit of equality. Please contact us if you want to help in any way.